A little while ago when I visited Sambrook’s, I learnt all about inner-city brewing. I was also told about a new porter that they were working on for the Christmas season. Well that porter has now arrived and to celebrate, Duncan Sambrook threw a little party so guests can sample the latest offering from the London brewery. The bash took place at the brewery itself and was attended by family, friends, and publicans. The new porter – Powerhouse Porter – was available on tap as well as of course Sambrook’s permanent ales Junction and Wandle. The fermentation tanks were moved aside to make room for tables, chairs and patio heaters offering a much needed blanket of warmth. Fishclub served up some of the best fish and chips I’ve ever had (the batter was made with Sambrook’s Wandle), complete with lemon wedge and tartare sauce. 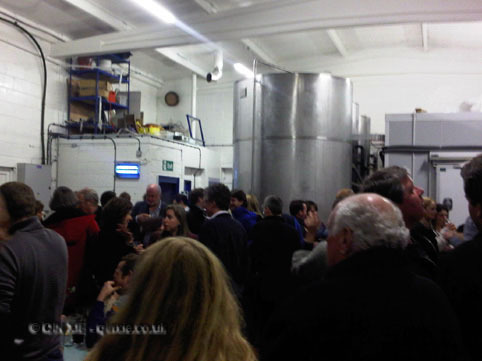 Duncan Sambrook was also on hand to give guests guided tours around the brewery. So just how was the new porter? It was intensely chocolatey in colour and tasted smooth with a hint of chocolate. There wasn’t any bitter after taste so it went down very easily. In fact, it was the perfect accompaniment for the fish and chips. Just be careful – even though it doesn’t taste strong, Powerhouse Porter has an ABV of 5% and is the most alcoholic offering from Sambrook’s to date. Powerhouse Porter is now available at selected pubs across London.